I had an opportunity to meet Tony Bennett once at Sandpoint, Idaho, during the summer festival there. I went to Sacramento College to see and listen to Dave Brubeck and Cal Tjader in the mid-fifties. So of course this article I’m re-posting by Charles Gans of the Associated Press resonated with me. President John F. Kennedy’s White House made this jazz summit possible when it booked Brubeck and Bennett to perform at a concert on Aug. 28, 1962, for college-age summer interns. The crowd was so big that the concert had to be moved from the Rose Garden to an open-air theater at the base of the Washington Monument. After Brubeck and Bennett each performed with their bands, the pianist came back on stage with his drummer Joe Morello and bassist Eugene Wright to accompany the singer on four encore numbers: “We haven’t rehearsed this, so lots of luck, folks,” Bennett joked with the audience. Columbia Records had sent its mobile recording unit to tape the concert. But only one song, their version of “That Old Black Magic,” surfaced years later on several compilation albums. The nearly one-hour tape had been mislabeled as “American Jazz Concert” with no reference to the two jazz legends and ended up lost in a section of the massive Sony Music Entertainment archives mostly devoted to classical music recordings. Matt Kelly, director of the archives, was doing routine research last year into Columbia recording sessions done 50 years ago when he pieced together the paper trail that would lead to the tape’s discovery. He cross-referenced incomplete logbook entries for an Aug. 28, 1962, live recording in Washington, which didn’t list the performers’ names, and separate listings for Bennett and Brubeck sessions that same day. After Brubeck’s death at age 91 on Dec. 5, Bennett’s camp prodded Sony to see if a tape of the Washington concert existed and it was quickly located. 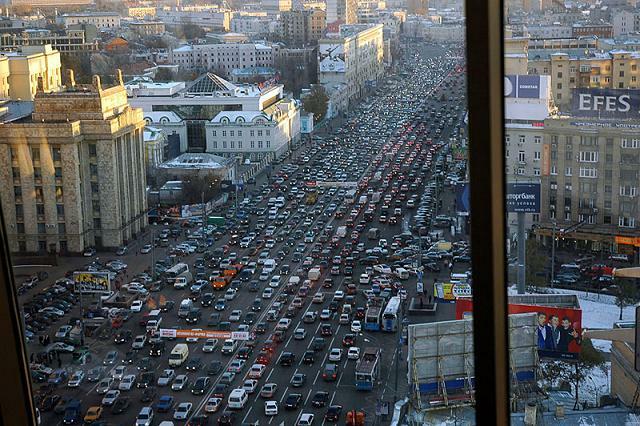 “I was shocked they even had it,” Bennett said in a telephone interview. John Jackson, Sony Legacy’s vice president of A&R and Content, was surprised to find the tape in pristine condition and decided it had to be released. Brubeck’s classic quartet — with alto saxophonist Paul Desmond — begins the set by playing the odd-metered “Take Five” at a faster tempo than on their groundbreaking 1959 album “Time Out,” which the year before had peaked at No. 2 on the pop album charts. The rest of the set includes Brubeck compositions inspired by the rhythms of countries where he had performed — “Nomad” (Afghanistan), “Thank You (Dziekuje)” (Poland) and “Castilian Blues” (Spain). Their joint performance offers a rare chance to hear Brubeck perform Great American Songbook standards with a top-flight jazz singer and Bennett unleash his jazz chops often kept in check on his more pop-oriented Columbia recordings. They begin their impromptu performance with a brisk “Lullaby of Broadway” in which Bennett unexpectedly changes the lyrics to “Come along and listen to the lullaby of … Dave Brubeck” and the pianist quickly jumps into his solo. On “Chicago (That Toddlin’ Town),” Brubeck’s solo gets somewhat funky. Bennett starts off singing “There Will Never Be Another You” as a slow ballad, but suddenly shifts to a fast tempo displaying some daring jazz phrasing, accompanied by Brubeck’s rapid-fire bop lines. They didn’t perform together again until the 2009 Newport Jazz Festival when Brubeck sat in with Bennett to reprise “That Old Black Magic” — an encounter encouraged by jazz buff Clint Eastwood, who was producing a Brubeck documentary. At the time, Brubeck expressed his admiration for Bennett. His 1962 performance inspired Bennett to work with other jazz pianists. Bennett says he met Bill Evans for the first time at that Washington concert and they would record two albums in the 1970s that rank among the best of the singer’s career. He recently recorded an album of Jerome Kern tunes with husband-and-wife jazz pianists Bill Charlap and Renee Rosnes for later release. Bennett, who will celebrate his 87th birthday in August with a Hollywood Bowl concert, is also planning to record a jazz CD with Lady Gaga later this year. He was impressed by her performance of “The Lady Is a Tramp” on his Grammy-winning 2011 “Duets II” CD. Here’s That Old Black Magic, and There Will Never Be Another You from those historic sessions — enjoy! 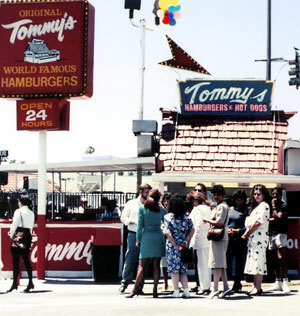 Original Tommy’s was opened on May 15, 1946, by Tom Koulax (October 26, 1918 – May 28, 1992), the son of Greek immigrants, on the northeast corner of Beverly and Rampart Boulevards west of downtown Los Angeles. The stand, which still exists today, sold hamburgers and hot dogs topped with chili. At first business was slow, but started to pick up. During the 1960s, the entire lot at this intersection was purchased. Soon after, the northwest corner was acquired for expanded parking and storage of goods. Not long after that, a second service counter occupying the building at the perimeter of the northeast lot was set up. The food was essentially the same from both locations, except for longer lines at the original shack counter, perhaps for nostalgic reasons. Koulax credited the students, both as workers and customers, from nearby Belmont High School for making Tommy’s a success. 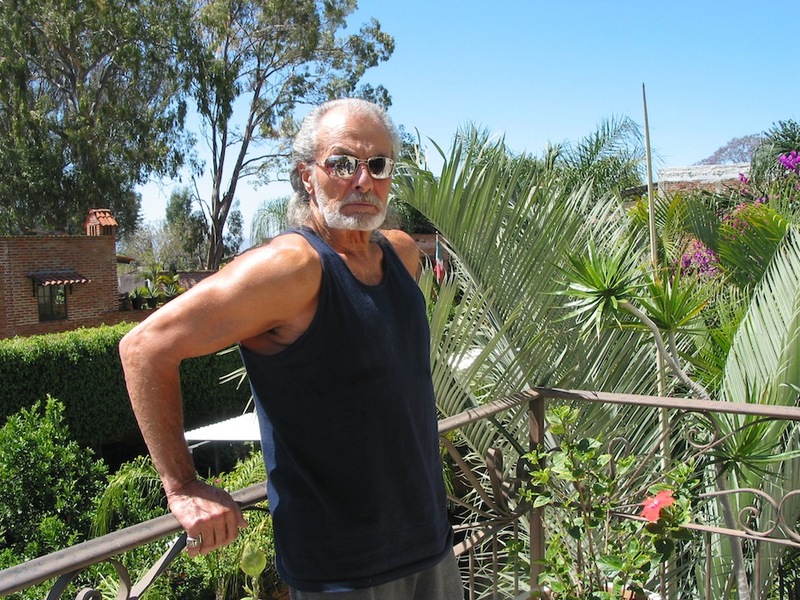 He supported the school by placing advertisements in the school newspaper and yearbooks. In his last will and testament, he left a scholarship fund for Belmont. In the 1970s, Tommy’s initiated a conservative expansion plan, growing from the original location to 30 locations in 2006. 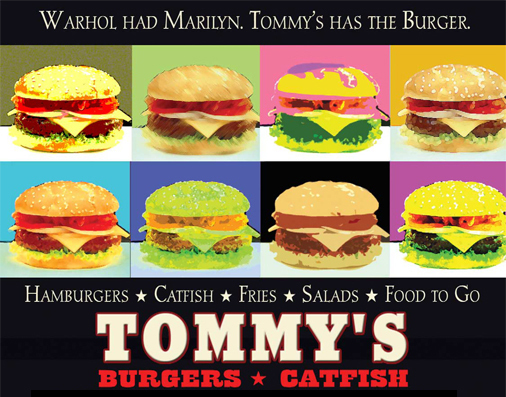 Tommy’s did not expand to more than a handful of locations per year. 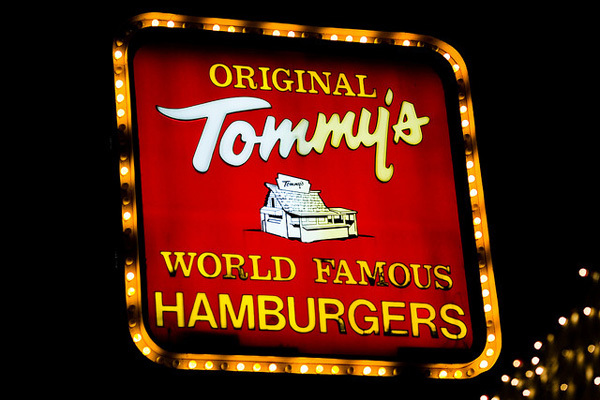 Most Original Tommy’s restaurants are found in the Greater Los Angeles Area. There are also Original Tommy’s restaurants in San Diego, Barstow, Palmdale, La Habra, Riverside, Henderson, Las Vegas, and most recently, in Lake Forest. In recent years several locations have closed. The company is based in Monrovia, California, after years at Glendale, California, and is run by the late Mr. Koulax’ family. The restaurants are all company-owned, and there are no plans for the company to offer any franchised locations. A ladle or two of Koulax’ signature chili tops nearly every available menu item, even the breakfast sandwich. 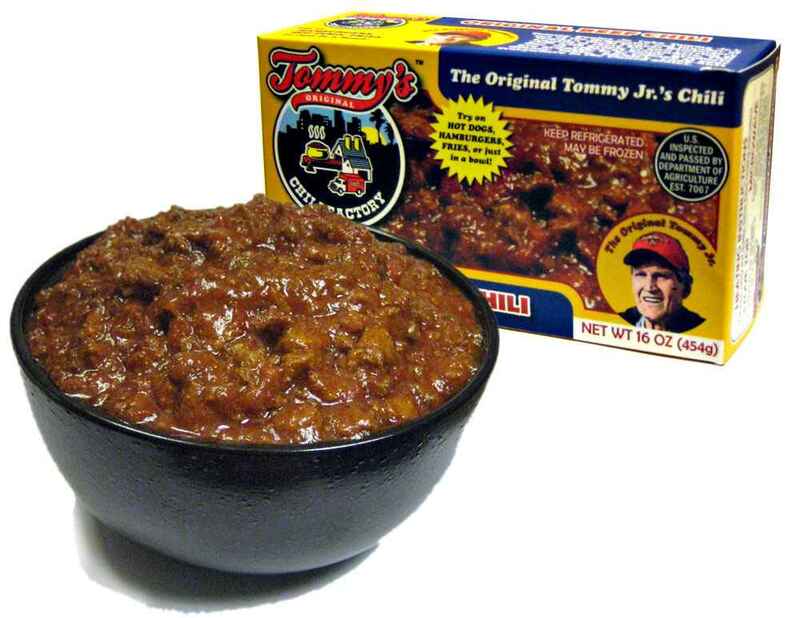 Original Tommy’s chili is a mixture of an all-beef chili con carne base, flour, water, and a “secret” blend of spices, and resembles a condiment more than a conventional bowl of chili. The flour-water mixture allows the chili to “set up” and adhere to the burger or fries. Except for an occasional television commercial and a brief flirtation with radio advertising in the 1990s, Original Tommy’s has relied on word-of-mouth and local newspaper advertising to gain popularity. It was a cold Saturday night in November, My partner Larry Gardner and I were enjoying a cup of coffee and donuts at “Arnie’s,” located at Santa Monica Boulevard and Bundy Drive. I was listening to “Walk of Life” coming from the vehicle parked next to us. The blonde driver was flirting with Larry; business as usual for him. We knew it must be serious as two other units were dispatched to Twenty’s location besides us. Without saying a word we emptied our coffees on the pavement. Kicking over the V8, I accelerated out of the parking lot and sped to the meeting place. A few minutes later we pulled into the parking lot next to 8-L-20 Sergeant Jesse Escobar. Escobar climbed out of his Black and White, as usual his hair was perfectly styled, his uniform looked like it’d just been pressed, his two-toned badge gleamed, and his black shoes shone like glass, even under the dim overhead light. I’d known Escobar for several years; he was known as a policeman’s sergeant. We were lucky to have him. 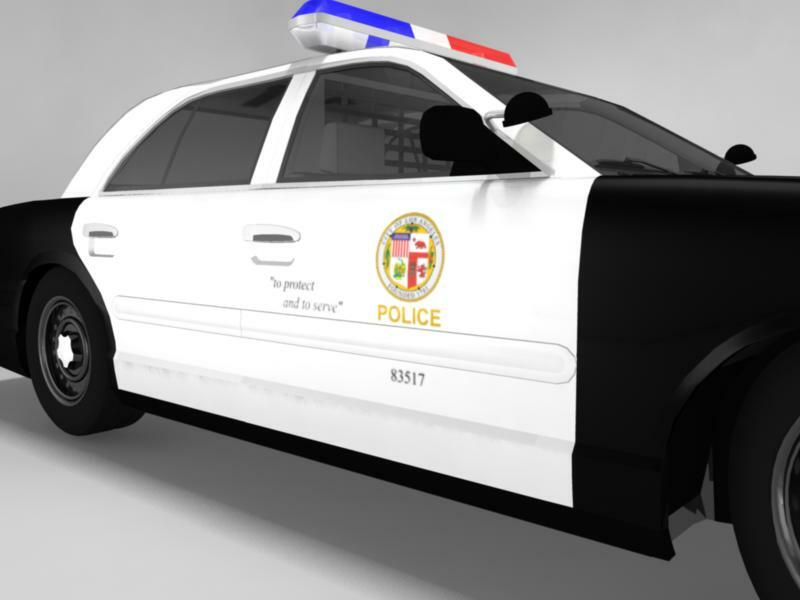 as the three-striper was going up the LAPD ladder. Shortly, we were joined by the two other assigned units. “Guys we have a real situation. so pay attention.” The sergeant laid out a hand-drawn map of a residence located at 2 Benedict Canyon Drive. As we followed Sergeant Escobar’s black-and-white station wagon, we were silent, lost in our own thoughts. I wondered what we would run into. I had a real uneasy feeling about this one. When we parked in tandem and were on foot, Escobar once again pulled out the map. Using his flashlight, he ordered the others to the four corners of the house. Why did he leave me out? We quietly moved to the rear of the house, where a light could be seen. A closer look determined it came from a laundry room hallway. Sergeant Escobar tried the screen door. Unlocked. I followed as he crept cautiously down the dimly lit hallway, past the laundry room and toward a room where the light was bright. It was the kitchen. Escobar peered into the kitchen and then he looked back at me. He held up one finger and then pointed it down. I knew that meant one down. Escobar stepped into the kitchen. I followed on his heels. 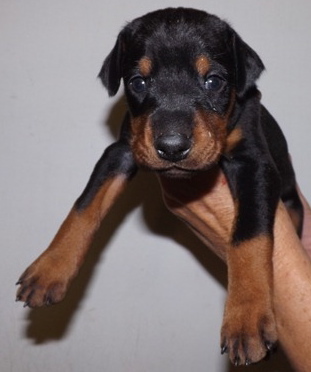 I spotted the lifeles,s half-open eyes of a female staring up at me. The dead woman was lying in a huge pool of blood that almost covered the entire tile floor. I could clearly see powder burns on her bare breasts and stomach. Quickly looking about, I could see blood all over the kitchen walls, ceiling, refrigerator, stove, and cabinets. I stepped over her and felt my shoe soles picking up a sticky substance. Blood. I spied Escobar in the living room hand motioning for me to go to the left as he was going to the right. OK, I signaled back with a head nod. He disappeared into the darkened next room. I slowly moved down the partially lit hallway. Almost immediately, I spotted a body lying in the middle of the hallway ahead of me. As I approached I could now see it was another female. One half-open lifeless eye stared into space. A contact wound had blown out her left eye. I stepped over her body, wondering what the hell was next? Seeing a lighted room ahead, I crept forward and peeked around the open doorway. I saw a leatherette recliner chair with a human arm hanging over the side facing me. I eased up to the chair and gave it a swift kick to surprise whoever was seated on it. The chair swiveled to the left, and a male slumped forward and onto the floor. His clothed body ended up on his knees as if he was praying. A large collection of coagulated blood stained his back. It appeared to be an exit wound from a large caliber firearm. I was startled when Escobar, in a calm voice said, “The rest of the house is clear. Looks like we will need the detectives for this one,” he continued. He went outside and released the other two units. My partner and I secured the scene. Several hours later the detectives arrived and began their investigation. The coroner’s deputies later drove up. After they scanned the scene, they took the bodies and transported them downtown to the Coroner’s office. They would join other corpses awaiting autopsies. The Bradbury Building is an architectural landmark in downtown Los Angeles, California. Built in 1893, the building was commissioned by LA mining millionaire Lewis L. Bradbury and designed by local draftsman George Wyman. It is located at 304 South Broadway and 3rd Street, and has been the site of many movie and television shoots, rock videos, and works of fiction. It’s the location of the office of Eagon Quinn, a character in my Mike Montego novels, set in 1960’s Los Angeles. Lewis L. Bradbury (November 6, 1823–July 15, 1892) was a mining millionaire – he owned a mine named Tajo in Sinaloa, Mexico – who became a real estate developer in the latter part of his life. He planned in 1892 to construct a five story building at Broadway and Third Street in Los Angeles, close to the Bunker Hill neighborhood. A local architect, Sumner Hunt, was first hired to complete a design for the building, but Bradbury dismissed Hunt’s plans as inadequate to the grandeur of his vision. He then hired George Wyman, one of Hunt’s draftsmen, to design the building. Wyman at first refused the offer, but then supposedly had a ghostly talk with his brother Mark Wyman (who had died six years previously), while using a planchette board with his wife. The ghost’s message supposedly said “Mark Wyman / take the / Bradbury building / and you will be / successful” with the word “successful” written upside down. After the episode, Wyman took the job, and is now regarded as the architect of the Bradbury Building. Wyman’s grandson, the science fiction publisher Forrest J. Ackerman, owned the original document containing the message until his death. Coincidentally, Ackerman was a close friend of science fiction author Ray Bradbury. Wyman was especially influenced in constructing the building by the 1887 science fiction book Looking Backward by Edward Bellamy, which described a utopian society in 2000. In Bellamy’s book, the average commercial building was described as a “vast hall full of light, received not alone from the windows on all sides, but from the dome, the point of which was a hundred feet above … The walls and ceiling were frescoed in mellow tints, calculated to soften without absorbing the light which flooded the interior.” This description greatly influenced the Bradbury Building. 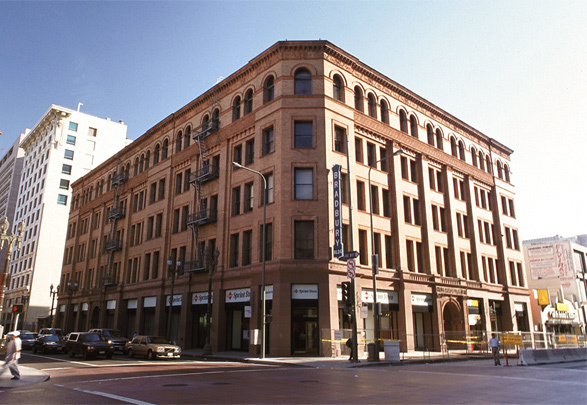 A restoration and seismic retrofitting was undertaken by developer Ira Yellin and project architect Brenda Levin Associates in 1991. As part of the restoration, a storage area at the south end of the building was converted to a new rear entrance portico, connecting the building more directly to Biddy Mason Park and the adjacent Broadway Spring Center parking garage. The building’s lighting system was also redesigned, bringing in alabaster wall sconces from Spain. The building features an Italian Renaissance Revival -style exterior façade of brown brick, sandstone and panels of terra cotta details, in the “commercial Romanesque Revival” that was the current idiom in East Coast American cities. But the magnificence of the building is the interior: reached through the entrance, with its low ceiling and minimal light, it opens into a bright naturally lit great center court. The five-story central court features glazed brick, ornamental cast iron, tiling, rich marble, and polished wood, capped by a skylight that allows the court to be flooded with natural rather than artificial light, creating ever-changing shadows and accents during the day. Cage elevators surrounded by wrought-iron grillwork go up to the fifth floor. Geometric patterned staircases and wrought-iron railings are used abundantly throughout. The wrought iron was created in France and displayed at the Chicago World’s Fair before being installed in the building. Freestanding mail-chutes also feature ironwork. During construction an active spring was found beneath the work-site, posing a threat to ongoing work on the building by weakening the foundation. However, Mr. Bradbury was very committed to the project, which he believed to be the greatest monument possible to his memory. Consequently, he imported massive steel rails from Europe to bolster the building and allow its construction to continue. The initial estimate for the construction of the building was $175,000, but the final cost at completion was over $500,000—an extremely large amount for those times. Using the GDP Deflator method, this amount translates to more than $11 million in 2008 dollars. Lewis Bradbury died months before the building opened in 1893, although it stands as a testament to his and George Wyman’s vision. The building has operated as an office building for most of its history. 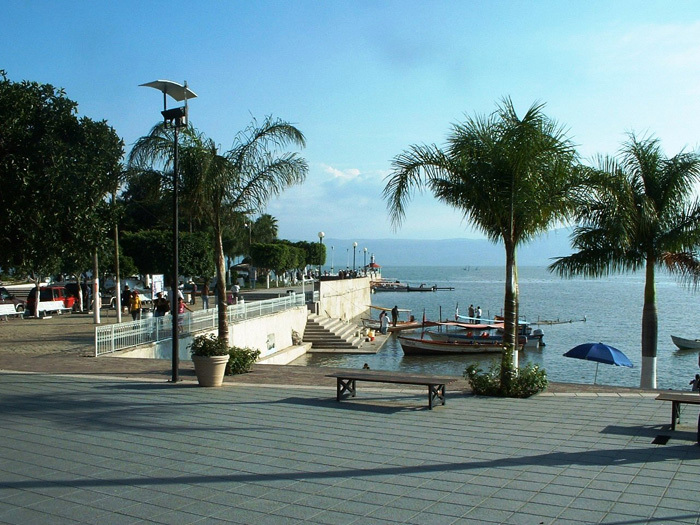 It was purchased by Ira Yellin in the early 1980s, and remodeled in the 1990s. It was designated a National Historic Landmark in 1977. The building has served as headquarters for the Los Angeles Police Department’s Internal Affairs division and currently is used by other government agencies. Several of the offices are rented out to private concerns, including Red Line Tours. The retail spaces on the first floor currently house Ross Cutlery (where O.J. Simpson purchased a stiletto that figured in his murder trial), a Subway sandwich restaurant, a Sprint cell phone store, and a real estate sales office for loft conversions in other nearby historic buildings. The building is a popular tourist attraction. Visitors are welcome daily and greeted by a government worker who provides historical facts and information about the building. Visitors are allowed up to the first landing but not past it. Brochures and tours are also available. It is close to three other downtown Los Angeles Landmarks: the Grand Central Market and the Million Dollar Theater (across the street) and Angels Flight (two blocks away). 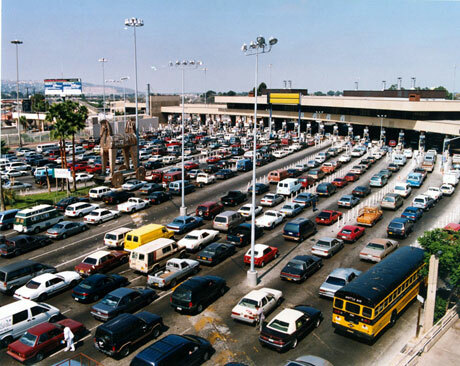 The building is accessible from the Los Angeles MTA Red Line via the Civic Center exit three blocks distant. The Bradbury Building is featured prominently as the setting in films, television, and literature – particularly in the science fiction genre. Most notably, the building is the setting for both the climactic rooftop scene of Blade Runner (1982), as well as the set of the character J. F. Sebastian’s apartment in which much of the film’s story unfolds. The Bradbury Building appeared prominently in the noir films D.O.A.’(1950) and I, The Jury (1953). M (1951), a remake of the German film, contains a long search sequence filmed in the building, and a spectacular shot through the roof’s skylight. The five-story atrium also substituted for the interior of the seedy skid row hotel depicted in the climax of Good Neighbor Sam (1964), supposedly set in San Francisco but almost entirely shot in Los Angeles. The Bradbury Building is also featured in The White Cliffs of Dover (1944), The Indestructible Man (1956), Caprice (1967), Marlowe (1969), the 1972 made-for-television movie The Night Strangler, Chinatown (1974), The Cheap Detective (1978), Avenging Angel (1985), Murphy’s Law (1986), The Dreamer of Oz (1990 TV movie), 1994’s Wolf and Disclosure, Lethal Weapon 4 (1998), Pay It Forward (2000), (500) Days of Summer (2009), and The Artist (2011). Television series that featured the building include the 1964 The Outer Limits episode “Demon with a Glass Hand.” During the season six episodes (1963–64) of the series 77 Sunset Strip, the Stuart “Stu” Bailey character had his office in the Bradbury. In Quantum Leap the building is seen carrying the name “Gotham Towers” in Play It Again, Seymour, the last episode of the first season (1989). The building appeared in at least one episode of the television series Banyon (1972–73), City of Angels (1976) and Mission: Impossible (1966–73), as well as in the “Ned and Chuck’s Apartment” episode of Pushing Daisies, which debuted in 2007. The building was also the setting for a scene from the series FlashForward in the episode “Let No Man Put Asunder.” In 2010 the building was transplanted to New York City for a two-part episode of CSI NY. The Bradbury Building and a fake New York City subway entrance across the street were also used to represent the exterior of New York’s High School for the Performing Arts in the opening credits of the television series Fame. The Bradbury appeared in music videos from the 1980s by Heart, Janet Jackson, Earth Wind and Fire and Genesis, and a Pontiac Pursuit commercial. Part of Janet Jackson’s 1989 film short Janet Jackson’s Rhythm Nation 1814 was filmed in the building as well. The interior appears in the music video for the Pointer Sisters’ 1980 song, “He’s So Shy.” The Bradbury Building was also used for Tony! Toni! Toné!’s “Let’s Get Down” music video. The building was featured in the photography on the Microsoft Office SharePoint Portal Server 2003 box, while the personal computer game SimCity 3000 shows the building as one of many built in the so-called Medium Commercial zones. The Bradbury has been frequently alluded to in popular literature. 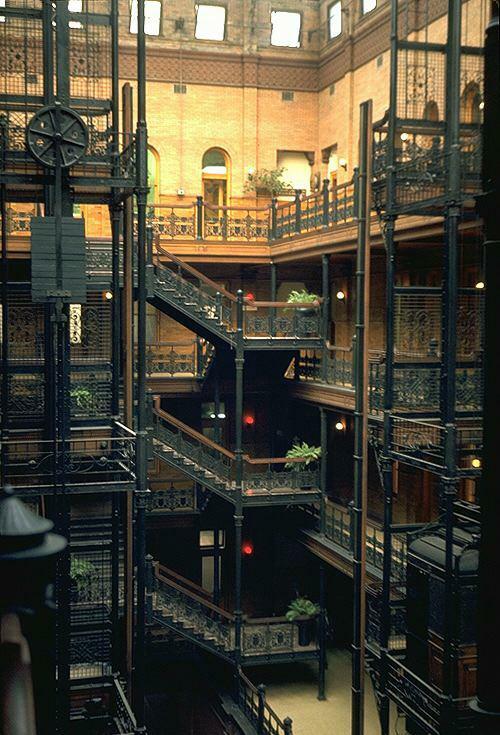 In Gravity’s Rainbow by Thomas Pynchon, the protagonist refers to Philip Marlowe, who would “feel homesick for the lacework balconies of the Bradbury Building.” In the Star Trek novel The Case of the Colonist’s Corpse: A Sam Cogley Mystery, the protagonist works from the Bradbury Building four hundred years in the future. Other allusions occur in The Man With The Golden Torc by Simon R. Green, and the science fiction multiple novel series The World Of Tiers by Philip Jose Farmer. DC Comics and Marvel Comics – the latter of which has offices in the real Bradbury Building – both published comic book series based on characters that work in the historic landmark. The building serves as the headquarters for the Marvel Comics team The Order, and in the DC universe, the Human Target runs his private investigation agency from the building. 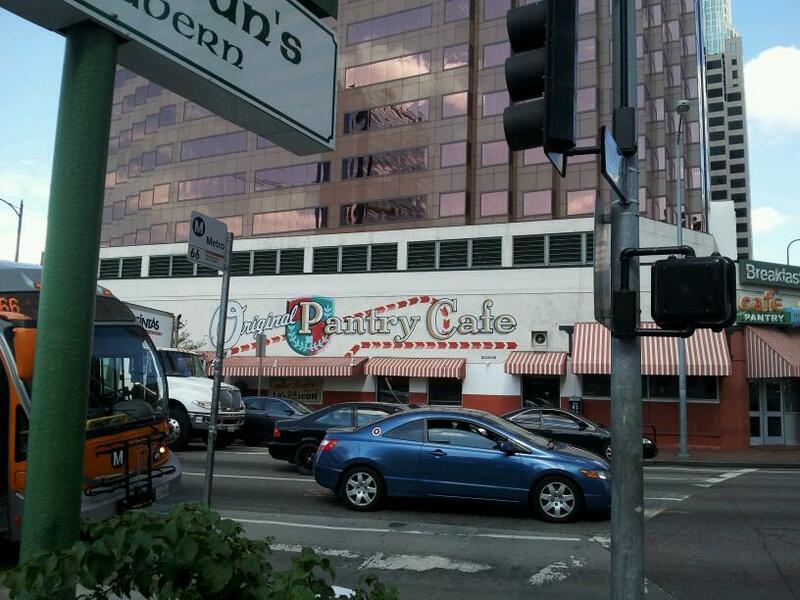 Located at 877 South Figuroa, the Pantry is a favorite eating spot for retired Homicide Detective, Eagon Quinn, who practices law out of the Bradbury Building on South Broadway, a character in my Mike Montego novels. The Oldsmobile Starfire was an automobile produced by the Oldsmobile division of General Motors in two generations from 1961 to 1966, and 1975 to 1980. The Starfire nameplate was also used for the 1954–1956 Ninety- Eight series convertibles, and all 1957 Ninety-Eight series models. 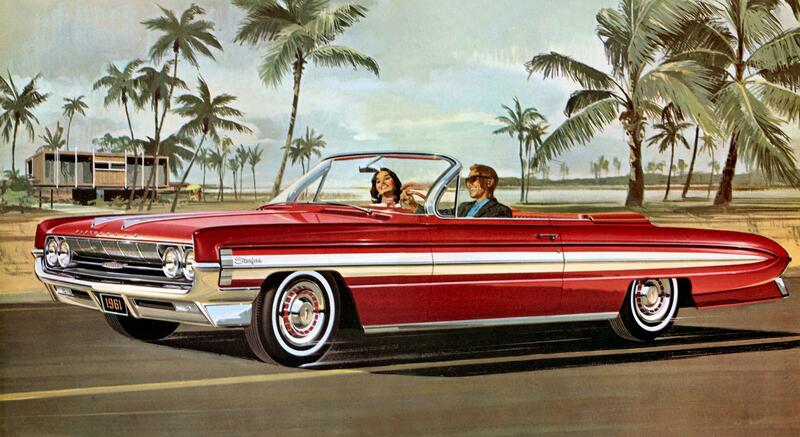 1961 was the first year for the Starfire as a separate model, available in a single convertible body style. The Starfire competed in the growing personal-luxury car market as was typified by the 4-passenger Ford Thunderbird first introduced for the 1958 model year. However, the Starfire shared most of its sheet metal with other models, and was considered part of the full-sized Oldsmobile line. The Starfire Hardtop Coupe joined the convertible for the 1962 model year. The convertible was dropped for the final 1966 model year, moving to the Eighty-Eight model line. The Starfire returned as Oldsmobile’s first subcompact car for the 1975 model year, featuring a V6 engine supplied by Buick. The 1977 Starfire featured the first-ever Oldsmobile four-cylinder engine as standard equipment, with the V6, and a V8 engine optional. The 1962 Starfire was distinguished from other Oldsmobile models by its unique aluminum trim, chrome engine dressing, and space age interior, featuring bucket seats, a center console, and a then-cutting edge console mounted shifter. 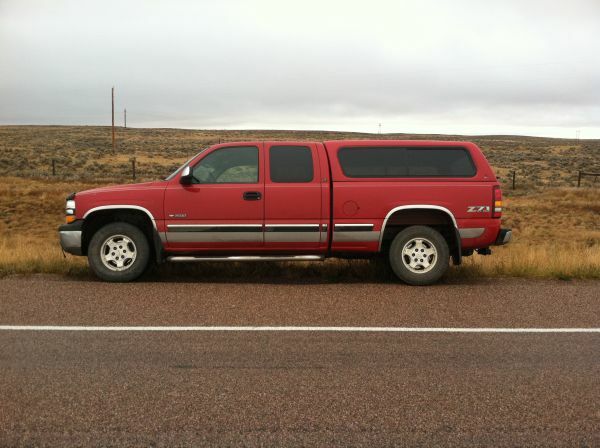 ￼The Starfire was equipped with a 345 horsepower 394 cubic-inch V-8 and automatic transmission. The Starfire name was first used by Oldsmobile on a one-of-a-kind dream car that was shown at the 1953 Motorama auto show. Named after a Lockheed jet fighter plane, namely the F-94, the original Starfire was a 5-passenger convertible that had a fiberglass body, a 200 hp (150 kW) Rocket V8 engine, and a wraparound windshield like that used on the top-of-the-line and limited-production 1953 Fiesta 98 convertible. The name was then used for the 1954–1956 model years to designate the convertible models of the 98 line in much the same way that the Holiday name was used to designate hardtop body-styles. The 1954–1956 Oldsmobile 98 Starfire convertibles were the most expensive Oldsmobiles offered during those years. During the 1957 model year, all 98 models were referred to as being Starfire 98s. The name was dropped from the 98 series beginning with the 1958 model year. Introduced in January 1961 as a convertible, the first Starfire shared its body and wheelbase with the Super 88 and the lower-priced Dynamic 88. It was loaded with standard equipment including leather bucket seats, center console with tachometer and floor shifter for the Hydra-matic transmission, and was the first U.S. full-sized production car to feature an automatic transmission with a console-mounted floor shifter, brushed aluminum side panels and power steering, brakes, windows and driver’s seat. With a base price of $4,647 in 1961, it was the most expensive Oldsmobile, even more than the larger Ninety-Eight models. The standard 394 cubic inch V-8 Skyrocket V8 engine – Oldsmobile’s most powerful in 1961 – used a 4-barrel Rochester carburetor and generated 330 hp (246 kW) at 4600 rpm. Sales of the 1961 model were 7,800. For the 1962 model year, the convertible was joined by a two-door hardtop, which featured a new convertible roofline shared with other Olds 88 coupes. Horsepower was up to 345 hp (257 kW). 1962 was the best sales year for the first generation Starfire with sales of the hardtop coupe being 34,839 and sales of the convertible being 7,149. Styling changes for the 1963 model year included a move away from the sculpted sides of the previous years model, to a flatter, more conventional look with an exclusive squared off roofline that included a concave rear window. Sales of the coupe were down to 21,489 and the convertible was down to 4,401, a drop of 38%, probably due to intense competition from Buick’s all-new Riviera, which was in the same price range as the Starfire but had its own unique body shell.